In 2010, the SEC mandated that publicly-traded companies disclose their director nomination process for considering diverse candidates. The SEC took this action, in part, because shareholders lacked insights into how directors were selected, had no voice in these selections, and yet were asked to vote on a slate. In 2015, Equilar crunched the numbers on the composition of boards for the Fortune 1000 companies. They found that, in 2014, 17.5% of these boards included women, up 3.7% from 2010. That’s a four-fold increase. In 2016, Statistica published research showing that 20.2% of board positions at Fortune 500 companies were held by women. But, the point of increasing gender diversity on a board is not to simply include people who were previously excluded. No. The point of an effective Board of Directors is to benefit the company and the customers it serves. Let’s look at this in more detail. According to a 2017 report published by 2020 Women on Boards, 55% of companies that fell off the Fortune 1000 index had one, or zero, women on their board. Catalyst Group’s 2013 research shows that companies with the most female board directors performed better financially than those with the fewest. Such companies performed better from the perspective of return on equity, return on sales, and return on invested capital. In 2011, Italy enacted a law requiring specific quotas of women on the boards of companies listed on the Italian stock exchange. On September 30, California became the first state in the nation to require female representation on Boards of Directors for companies based in the state. While well-intentioned, such laws raise numerous questions about the perils of legislating any single board director attribute. Once one opens the discussion of required criteria, it begs the question of other – perhaps equally – important criteria to potentially require. Such laws may have unintended negative consequences. It will be interesting to follow as this unfolds. What Does It Mean for Health IT? For health IT companies, the percentages of female board representation vary widely. The boards of bio-tech companies with less than 1,000 employees, for example, have 9.7% female representation. Nearly 20% of publicly-traded health sector companies have female representation on their boards, and 27% of hospital boards include women. For a health sector company, it’s pivotal to have a diverse Board of Directors, because women drive 70-80% of all consumer purchasing. And, thanks to the US Department of Labor, we know that women make 80% of all health-related decisions. Plus, thanks to the same study, we know that women are more likely to be the caregiver when a family member becomes ill.
Women are buyers of health and healthcare services. Women are decision-makers. It’s in a health company’s best interests to involve their voice at the board level. What can we do to support the growth of health companies that want to succeed by offering world-class health/healthcare products and services to their customers and patients? A lot. 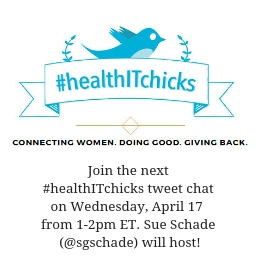 Engage in networking activities that support gender diversity in the health sector – such as #healthITchicks and HIMSS’ Women in Health IT initiative. Sign up to become a CSweetener mentor, and actively help women achieve C-Suite positions. All of these initiatives involve both men and women as active participants. When positions open up in your organization, think carefully about workplace diversity, and use expanded communication tools to find qualified candidates that you may have missed with old-style recruiting tactics. Add diversity as a plank in your company’s strategy, and encourage leadership to give voice to the power and value of diversity. Get educated about the research around pay equity in the digital health sector, and evaluate your company’s pay and promotion practices. And, last but not least, celebrate your achievements. Your organization’s patients, customers, employees, investors, and shareholders will join in the celebrations of effective corporate policy that’s good for the bottom line. By Carla Smith (@CarlaMSmith), EVP at HIMSS.